As horror writers go, perhaps none is more mysterious or more intriguing than Howard Phillips Lovecraft who died in March 1937 and who created the dark cosmos which is now known as the Cthulhu Mythos. In life, Lovecraft was as strange as any of his creations – a gloomy, withdrawn and introverted man wholly dependent on other people – indeed, so much so that many have suggested that he was in touch with things which we ourselves cannot see or sense and that they formed the basis of his macabre fiction. Much of his work centered round blasphemous tomes – the most famous being the “abhorred Necronomicon” – or remote and mysterious locations and this has prompted some to suggest that he was privy to occult and arcane knowledge that is denied to the rest of us and rightly so for it would send our minds crashing into madness. But is that the case? There is no doubt that Lovecraft’s vision is vivid and intense and utterly terrifying. It has served as an inspiration for other fans and writers who have both expanded and developed it down the years in their own fiction, in films and in role playing and video games thus keeping the vision fresh and unique. The landscapes which the Mythos envisages are bizarre and dangerous in the extreme. Here great and monstrous beings which have existed since the dawn of time come and go between Earth and the stars with impunity, disregarding Mankind as being of little interest as they did so. All of these ancient beings, however, had some impact on our world and sometimes manipulated individuals for their own eerie and unfathomable purposes. Indeed, much of the history of the world has been clandestinely guided by them towards their undefined objectives. But are such ideas truly rooted in fact or are they, as some have argued, simply the horrific distillation of Lovecraft’s own fears and nightmares? Certainly as a lonely and introverted boy Lovecraft had access to strange books on the travel and folklore of his great uncle Whipple Phillips’ library in the family home in Providence, Rhode Island and many of these writings may well have taken root in his steadily darkening mind. And some of the ancient houses of Providence itself, with their queer histories and curious traditions may also have intrigued him. In many respects he saw himself as an investigator of the unusual and the outré and this notion was to haunt him as he penned his ghostly fiction. Part of the source of the dreadful Universe also lay in Lovecraft’s inability to fully integrate into society and into general friendships and relationships. He always considered himself as an “Outsider”. True, he did form friendships – some which lasted until his death – and he actually was briefly married, which hinted at a relationship of sorts but he always found human society difficult and often chose to retreat into his own dark cosmos which he had fashioned out of his peculiar dreams, ideas and nightmares. But he did find face to face relationships difficult and preferred to keep the world at a distance – maintaining his friendships through voluminous letters. As a writer, Lovecraft was something of a failure in his own lifetime and indeed almost died in penury, having made very little from his imaginative fiction and reduced to “hackwork” and revisions. Nor did many of his friends or fans turn up to his funeral when he died, although there were disagreements over his estate afterward. And yet, the dark legacy which he has left behind has continued down to the present day – not only surviving but continuing to expand and grow like some mysterious seed planted in fertile ground – the minds of those who read them. Others too have taken up the mantle, placing their own stamp upon the Mythos – expanding it and taking it in new and even darker directions. In recent times, the followers of the Cthulhu across the world have never been more numerous. And in the background the shadowy influence of Lovecraft still lingers on. Did he really know things that we don’t and that we would be terrified to find out? In a new book “A Haunted Mind” Dr. Bob Curran traces the emergence of Lovecraft’s ideas and the sources of his inspiration. Exploring some more obscure avenues of myth and folklore Dr. Curran seeks to trace if there might be some deeper and darker truths hidden away behind some of Lovecraft’s fiction. Had he, for example, studied Middle Eastern lore and had he found some strange and unnerving inferences there? Was there indeed evidence of something which slumbered beneath the hills of rural New England, waiting to be awakened? Is there some concealed reality lurking somewhere beyond our own known only to a handful of savants of which Lovecraft was one? Dr. Curran delves deep into obscure myth and legend and well as into Lovecraft’s fiction to investigate. Some of his conclusions are extremely surprising. And he looks too at Lovecraft’s own life and examines the forces that shaped the strange writer and perhaps formed the basis of this own dark world. 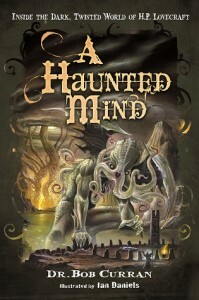 “A Haunted Mind” is a must for anyone who wants to understand Lovecraft and his influences but be warned! After reading it you may not look at either Lovecraft or your own world in the same way again! Throughout Dr. Bob Curran’s varied life, he has worked as a gravedigger, musician, journalist, and civil servant. He is now a history teacher and well-known throughout Ireland and beyond as a writer and broadcaster. He is the author of “Vampires”, “Forgotten Realms”, and “Man-Made Monsters”. He lives in Northern Ireland with his wife and family.